Do we need yet another online music service? Samsung certainly thinks so, as it's just introduced its very own internet radio service called, weirdly enough, Milk Music. So named for its supposed "fresh" take on music (Get it? Because milk is fresh? Yeah, we're not sure about that either), it's free to download from Google Play starting today. In fact, you can start streaming tunes immediately as soon as you launch it, no sign-up required. Best of all, the service is completely ad-free (for now at least -- we'll explain more about this later). The caveat, of course, is that it's exclusive to Samsung phones. Milk Music is a completely separate entity from Samsung's existing Music Hub subscription service, as the former is focused more as a free radio service that you can use without having to set up an account. At launch, Milk Music will only work on the Galaxy S3, the Galaxy S4, the Note 2, the Note 3 and GS4 variants like the Active and the Mini. It'll also be compatible with the upcoming Galaxy S5. Here's another interesting tidbit: all of Milk Music's 200 genre stations and catalog of nearly 13 million songs is powered by Slacker. Yep, that Slacker. That's why Samsung didn't have to do any licensing deals with content partners to release Milk Music -- all of that was left up to Slacker to handle. However, everything else about Milk Music -- the logo, the interface, the menus -- is all Samsung. And it's the design of Milk that really makes it stand out from other internet radio apps we've seen. The first distinct difference is apparent the second you launch the app -- you'll be presented with a large round dial populated with nine different genre stations along with Spotlight and My Stations. Spotlight is a set of "what's trending" stations curated by Samsung and Slacker that changes on a weekly basis. According to Samsung, Spotlight is also an opportunity to deliver Milk Music exclusives and "first-listens" from collaborators like Jay-Z. My Stations, as the name suggests, are stations you create yourself based on a particular artist or song. So for example, you can set up a Lorde station that'll play songs from her as well as related artists. You can also create a station based on all the songs that you've marked as favorites. When you swipe the dial in a circular motion, the app scans through the different stations just like on a regular radio tuner. Not only does the music change, the background art switches as you scroll through the stations and you'll feel a corresponding vibration as well. We experienced no discernible lag when switching stations -- the song changes were instant and immediate. We asked Samsung how they achieved this, and we were told that each station actually pre-caches the currently playing song by 8 seconds. This way the songs are teed up and ready to go as soon as you tune in. If you rotate the dial closer to the center of the circle, station selection goes by slower, while it zooms by at "nitro speed" when you're tuning it from the outer edge. By default, Milk Music offers nine of the most popular genres as selections on the dial. If you don't like the choices, you can hand-pick the nine you like most out of 15 available options. Each genre has several stations underneath it -- for example, there are about 20 different Pop stations and 11 Alt/Indie stations. If you'd rather select a specific station instead of turning the dial, simply tap the numbered circle next to the station name on the upper left corner, and you'll see a scrollable list. But what if you don't like the songs offered on a particular station? Well, you have several options. You may skip them -- Milk offers up to six skips per hour per station. You may also select "Never Play Song" from the menu so you never have to listen to a particular song again. Or, you can swipe upward from the bottom bezel to reveal a very interesting feature that lets you essentially fine tune the station's offerings based on popularity, release date, and how often your favorites turn up. So for example, if you wanted to set a station so that it only plays unpopular older music that you're not familiar with, well, you can do that. If you wish to listen to a previously aired song, you can do so as well, as Milk Music lists the last 500 played songs in its History. As for settings, you can adjust the audio quality to either Standard (50 kbps) or High (90 kbps), toggle explicit content on or off, or allow the app to use your location. While the app doesn't really use your location for anything specific right now, Samsung says that they might have an option for more localized content in the future. Last but not least, though sign-in isn't required, you may choose to hook Milk Music up to your Samsung account. This way, you can share your Favorites, History and station settings across several Samsung devices. 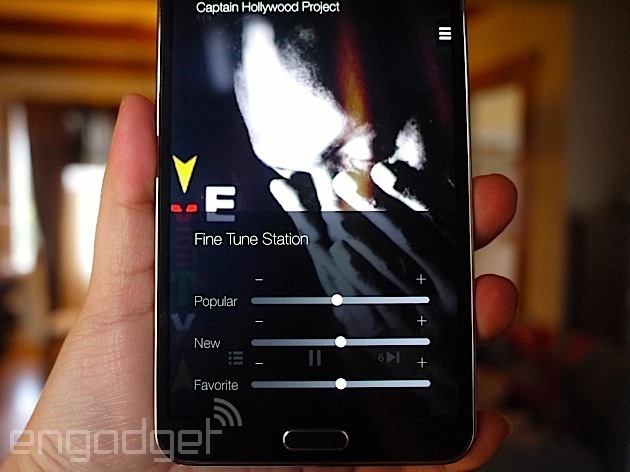 Milk Music was set up by Samsung to "address consumer pain points" when it comes to music services. "The first is that, music setup is often long and painful," said Chris Martinez, director of services planning for Samsung Telecommunications America, referencing the need to create usernames and passwords for most services. "Secondly, there are often too many ads and interruptions [...] Third, songs that play over and over due to a limited catalog." For now, there is no planned revenue model for Milk Music, and is considered more as a value add for Samsung customers. Indeed, Samsung representatives were keen on emphasizing to us that Milk Music is an ad-free service from the start. However, during the presentation, we were also told that the team will be evaluating that ad-free model as time goes on, and might consider ads in the future. Further, even though you cannot buy songs from Milk Music right now, they're not closed to that idea either. At the moment, Milk Music is a US service only. You have to be connected to listen to it -- either over WiFi or 3G -- and there's no offline caching. As for whether we'll see Milk Music available on tablets, Samsung says they're focused on nailing down the mobile phone experience for now, which means that won't be any time soon. Seeing as there are around 200 million Galaxy users worldwide, we're guessing Samsung won't have any trouble finding willing testers. The question now is whether they'll think it's the cream of the crop, or the sour milk at the back of the fridge.